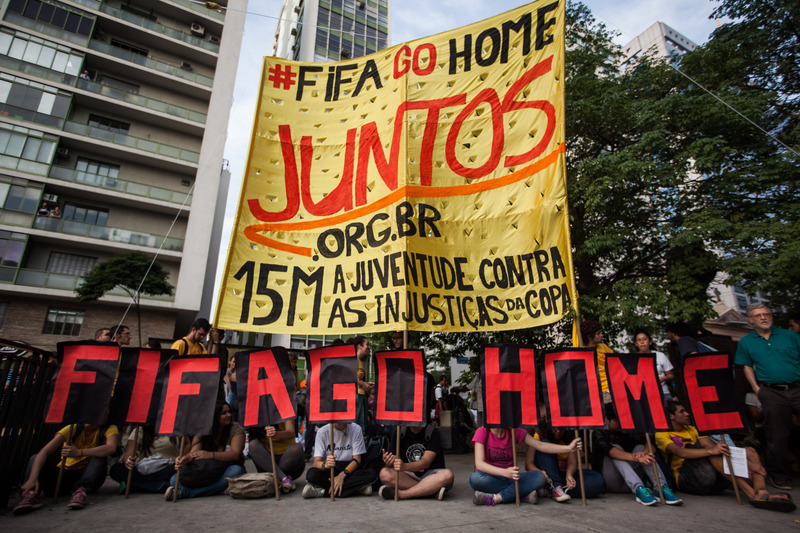 The world's most anticipated 2014 sporting event, Brazil's 2014 World Cup, kicked off Thursday amid protests against FIFA, the sporting organization that oversees soccer's biggest moment every four years. And FIFA is a pretty good target for the protests: the World Cup looks like it'll cost the host country, Brazil, a record $11 billion, according to The New York Times. Meanwhile, ESPN reports that FIFA is set to take in, oh, you know, $4 billion. Sure, FIFA may be spending $2 billion, but they're still taking $2 billion home with them. For Brazil to have $11 billion to shell out on a tournament, it must be doing pretty well, right? Well, wrong — hence the protests. The country's built or redone stadiums all over the country, including an $800 million one in Manaus, which is in the middle of the Amazon rainforest. That's almost as bad as holding a World Cup in, I don't know, Qatar. FIFA's Secretary-General Jerome Valcke told USA Today that spending shouldn't have been an issue for Brazil. When Brazil bid for the World Cup they had the budget to do so. As John Oliver noted recently on his new show Last Week Tonight, the supposedly nonprofit organization has more than $1 billion in reserves. So, back to the protestors who were out in force on Thursday as the World Cup kicked off. At least 1,000 people took to the streets to "peacefully" show their displeasure with the Cup and its growing costs to the country, Reuters reported, though they were greeted by riot police wielding rubber bullets and tear gas, and several people were injured. Paula Machado, a 24-year-old English teacher who marched Thursday, told the Times that the cops' response was not in proportion to the threat posed by the protestors. The police response was absurd. This is a violation of our rights. Despite all this, the Brazil team's fans are legion, and they're excited to see what the team can achieve. One Brazilian, Lizbeth Silva, summed this up perfectly to Reuters. I'm praying that nothing goes wrong. You hear about all these problems, but you still want to root for Brazil.